I LOVED this recipe!! 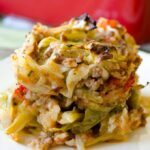 I will never go back to making stuffed cabbage the traditional way after making this. I wanted my meal meatier, so I added 1/2 lb of ground pork. I probably used about 8 cups of chopped cabbage (I had a big head of cabbage and didn’t know what the weight was, so I just went with it) and cooked it in salted water, which gave it more flavor. I drained the liquid from cooked meat when it was cooked through instead of letting it evaporate. I also added some beef seasoning and instead of 3/4 cup of water, I used 1 cup of hot and spicy V8 juice. I always make my stuffed cabbage a little spicy and the flavor from the V8 juice isn’t really too spicy but adds so much flavor. I cooked this for 1 hr. uncovered instead of 20 min. It was PERFECT!! We loved this recipe! We cooked the rice and then added the cooked rice to the hamburger mixture so there was no problem with uncooked rice. We also used a 15 ounce can of diced tomatoes and juice (basil flavored), and basil flavored tomato paste as well. We used half the Cayenne called for and it was still quite spicy–maybe a touch less next time. And finally, we poured 1/4 cup of water over the casserole before baking for a little extra moisture. Delicious! THis is the worst unstuffed cabbage recipe I have ever cone across. First of all, they say it’s ready in 50 minutes. Are you kidding me? It’s 10 minutes to blanch the cabbage, another 20 minutes to cook stovetop, then 40 minutes in the oven. 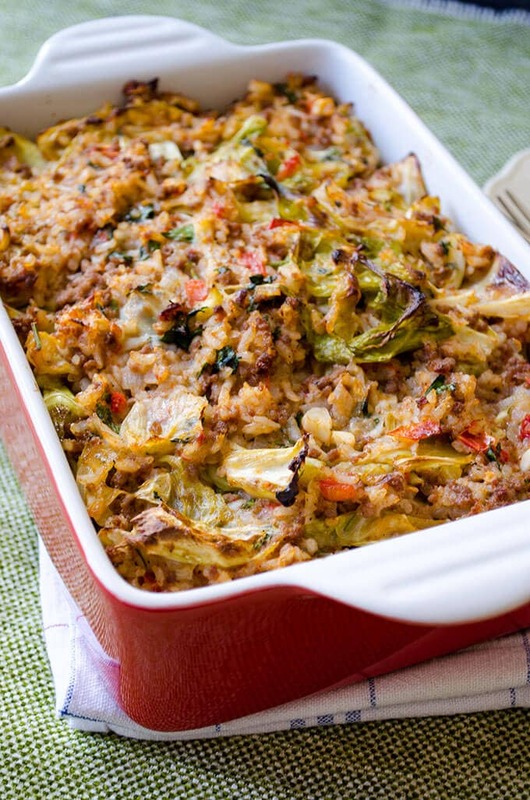 You will have used a pot to blanch the cabbage, a large pan to cook stovetop, and then a casserole pan in the oven. There are some steps that are NOT necessary, and when you are done, this dish lacks dimensional flavor. 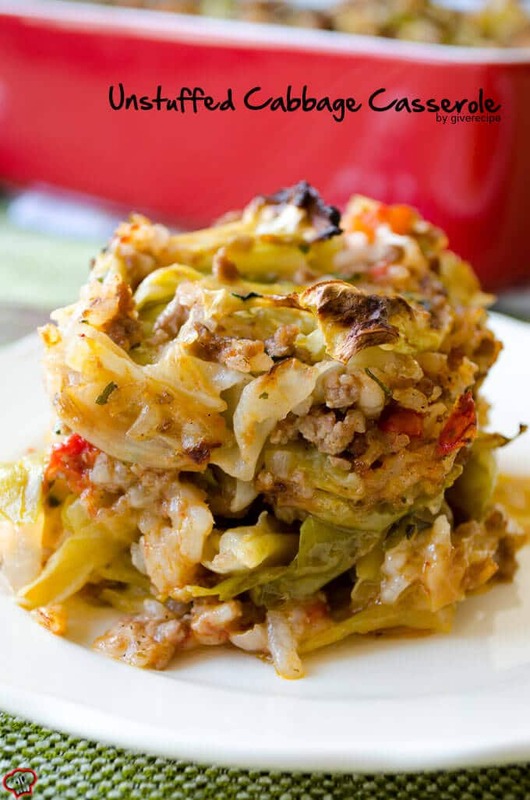 I could have made stuffed cabbage rolls MUCH faster than this, and much tastier. I totally agree w/ Susan page, very very time consuming, bland, and the timing of the ric and ant of water is way off. I will not be making it again!!!! Not much flavor either. I let the (basmati) rice boil while the meat was cooking (I used 1/2 lb Turkey, 1/2 lb beef and 3 turkey Italian sausage links) and added the rice without adding extra water to the dish. As I prefer to use tomatoe sauce instead of paste so the rice would soak up some of that flavor as it finished cooking. I also used a can of fire roasted tomatoes instead of fresh. Sprinkled some cheese when I took it out of the oven. I think this is a great recipe idea and just incorporated some of my own traditions and health choices. I forgot the Cheyenne pepper. But It was good! Thanks for the idea! Where do you get dried mint? Hi Andi, you can find it at online markets. This sounds like a good idea – the casserole-style approach will also make freezing leftovers easier. My only complaints are that you listed the prep time as 10 minutes and total time as 50; and that you reference “1 dish”. Yet reading through your recipe, it’s clearly well more than 10 minutes of active time, and over an hour total. If I had just read the top, I would not have left anywhere near enough time to make this. And it’s not one dish (even just for cooking) – there’s the pot, the pan, and the casserole dish. An hour of prep, three pots and pans, and then you still have to wait 40 minutes for it to bake. Nope. I am a seasoned cook and this recipe is horrible. I made this recipe exactly as indicated. Well, almost–I had to add some water and cook a little longer to get the rice fully cooked (I used white rice). Next time I will use only 1/2 teaspoon of cayenne–I thought a whole teaspoon added too much spice. I tasted it before adding the cayenne and the flavors were WONDERFUl, but adding so much cayenne seemed to take away from that, and is just too spicy for my palate in general. Overall I think this is a great healthy recipe, just like what I was looking for. I will definitely be adding it to my regular rotation! Thanks Genna for your feedback! I don’t need that water but it might depend on the heat, rice or even the tomatoes. I mean how juicy they are matters. The spices in this recipe is totally up to you. I love it spicy, but you can easily adjust it to your taste. Great taste, added some sour cream or Greek yogurt to the bowl to eat. Perfect! This is just off. Not enough water. Why cook everything twice? I tried this dish tonight and really enjoyed it! I actually added more diced tomatoes than called for and it turned out great. I also had a huge bag of carrots in the fridge, so I added a little shredded carrot too. I like the little twang of flavor the lemon added, but i think the recipe could use more of a bite. Maybe more cayenne? It was still great all the same, just mild in flavor. Glad to hear that you love the recipe. Thanks for sharing what changes you made. Adding shredded carrot is a great idea. What I love about this casserole is that you are free to make additions or to leave something out depending on your taste. This recipe took 3 1/2 hrs. to make. I used brown rice. The rice did not cook completely, and I cooked it for an hour before putting it in the oven AFTER I added the rice. 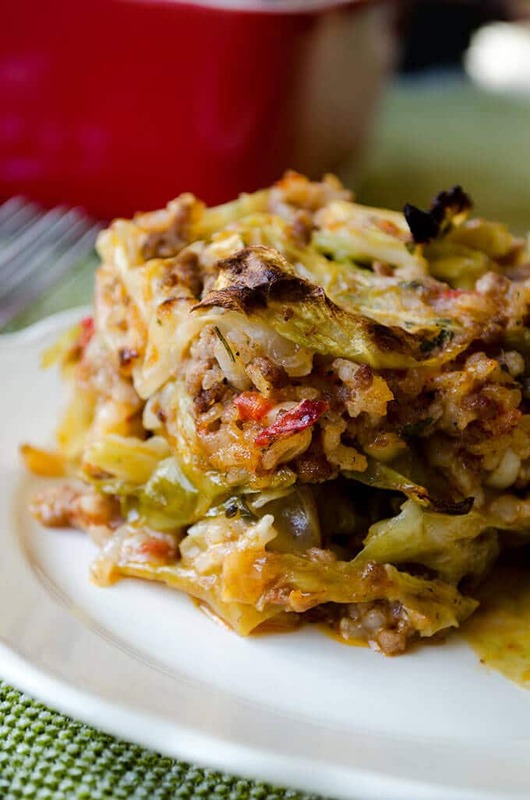 I will go back to making cabbage rolls the traditional way. It seems too much cayenne,did you mean Paprika?/ I still prefer traditional Turkish rolled cabbage leaves. to me it would not be much faster to go through all those steps.. In Istanbul Ottoman Palace style cooking the meat or onions are not supposed to be sauteed, instead they are all mixed all together. I am sure your recipe will be tasty,especially to americans who does not know the real ,much more neatly presented rolled cabbage leves. Hi Dilmeran! 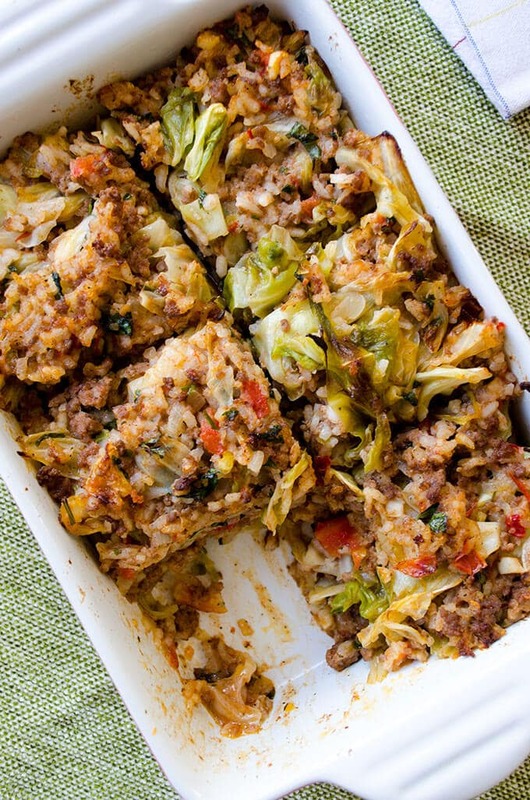 Cabbage rolls would always be my first choice, but this unstuffed version is a nice choice when I don’t have enough time or energy. What an amazing and through recipe. Such a great dish for a weeknight. Well done friends. PS: Love the video as well. Thank you our lovely friend! Isn’t it great when everything is cooked in one pot? I added a little more tomato sauce and it turned out delicious! My family loved it too! Overall good, but lacks flavor. Seems bland. I did not use a full teaspoon of cayenne, as I don’t like overly hot spicy dishes. But I did add salt where directed and it used Italian seasoning instead of mint (I don’t use it). It just needs more flavor and the ingredients are tasty but bland to me. perhaps Salsa would improve the flavor. This is how my family and I love it. Thanks Karen for sharing your idea to improve the recipe! Made this tonight and we loved it – thanks for sharing the recipe. I’m definitely going to make it again. I added cheese on top just before it goes in the oven.